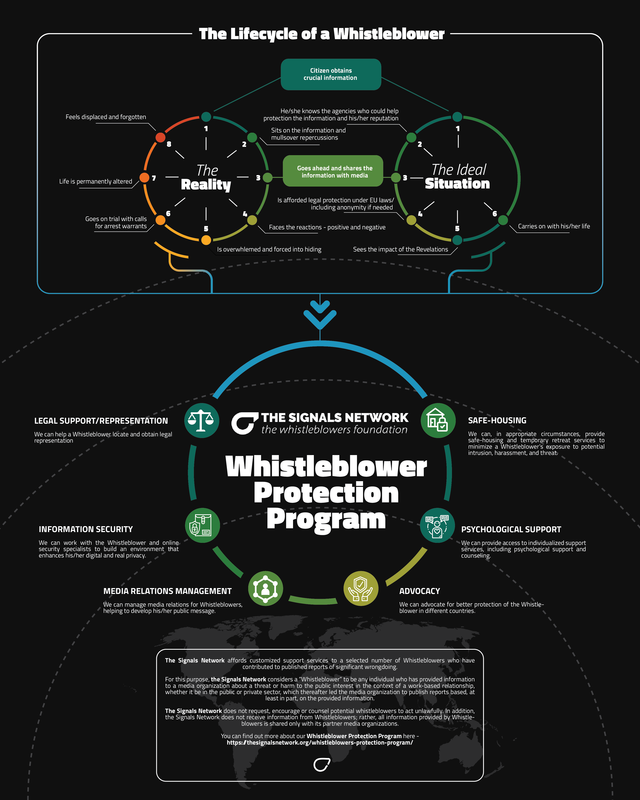 The Signals Network believes that whistleblowers are essential players in uncovering wrongdoing committed by the powerful and in strengthening our democracies. Following the arrest and extradition of Portuguese national, Rui Pinto, the whistleblower linked to Football Leaks, The Signals Network has helped convene a press conference in Lisbon on April 1, 2019. with his French and Portuguese lawyers, Member of European Parliament, Ana Gomes, and Luxleaks whistleblower Antoine Deltour. The Signals Network affords customized support services to a selected number of Whistleblowers who have contributed to published reports of significant wrongdoing. For this purpose, the Signals Network considers a “Whistleblower” to be any individual who has provided information to a media organization about a threat or harm to the public interest in the context of a work-based relationship, whether it be in the public or private sector, which thereafter led the media organization to publish reports based, at least in part, on the provided information. Each situation is unique, and each Whistleblower has unique needs. Whistleblowers can face legal, physical, psychological, and economic consequences. That is why the Signals Network customizes the support services it can provide to each selected Whistleblower. Because each Whistleblower’s circumstances are evaluated on a case-by-case basis, no Whistleblower can reasonably rely on the availability of any support services in advance. The Signals Network is currently able to provide support in the United States and in Europe, especially in France, Germany and the United Kingdom. This geographic scope will be extended in the future. The Signals Network does not request, encourage or counsel potential whistleblowers to act unlawfully. In addition, the Signals Network does not receive information from Whistleblowers; rather, all information provided by Whistleblowers is shared only with its partner media organizations. The types of services the Signals Network can provide to selected whistleblowers in appropriate cases are: Legal Support/Representation, Information Security, Media Relations Management, Advocacy, Psychological Support, and Safe-Housing. We can help a Whistleblower locate and obtain legal representation. We can work with the Whistleblower and online security specialists to build an environment that enhances his/her digital and real privacy. We can manage media relations for Whistleblowers, helping to develop his/her public message. We can advocate for better protection of the Whistleblower in different countries. We can provide access to individualized support services, including psychological support and counseling. We can, in appropriate circumstances, provide safe-housing and temporary retreat services to minimize a Whistleblower’s exposure to potential intrusion, harassment, and threat. The Signals Network has organized and compiled a roster of qualified, volunteer attorneys who are available to render advice to putative Whistleblowers about their legal rights and responsibilities prior to or in the course of providing information to a media organization. That roster is made available to partner media organizations and those organizations are authorized, without prior approval from the Signals Network, to refer a putative Whistleblower directly to a listed attorney. Following publication by a partner media organization of a report based, at least in part, on information provided by a Whistleblower, the Whistleblower can seek support services from the Signals Network through a request for such services made by a partner media organization. Following publication by a non-partner media organization of a report based, at least in part, on information provided by a Whistleblower whose identity has been made public, the Whistleblower can request support services from the Signals Network directly, through the email address provided on its website. The Signals Network will consider requests for support services on a case-by-case basis. As a first step, the Signals Network will determine whether the person satisfies the definition of a Whistleblower set out in these Operating Guidelines. If the person satisfies that definition and thereby qualifies as a Whistleblower, the Signals Network’s Executive Director will recommend to the Signals Network Board Engagement Committee appropriate types and levels of support services (nature and duration) based on the Whistleblower’s profile, needs, and expectations. The Signals Network Board Engagement Committee is composed of 6 members drawn from the Board of Directors and Board of Advisors, each serving a 1-year term: 3 members review requests from North America, and 3 members review requests from Europe. In each case, the Board Engagement Committee will review and act at its own discretion and on the Executive Director’s recommendation, taking into consideration the global, human, financial and public interest impact of the information provided to a media organization. No Whistleblower can reasonably rely on the availability of any support service before a request is acted on by the Board Engagement Committee. The Signals Network recognizes the crucial importance of confidentiality to investigative journalism and reporting and will vigorously protect the information about the identities of confidential Whistleblowers entrusted to it to the fullest possible extent of the law. In the vast majority of circumstances, by the time the Signals Network receives a request to provide support services to a Whistleblower, that person’s identity will have been made public in the wake of the partner media organization’s reporting. In those rare circumstances where that is not the case, because the Signals Network acts as a journalistic collaborator with its media organization partners, and disseminates the results of those collaborations on its own platforms, it would assert those privileges available to journalists and media organizations in the relevant jurisdiction(s) in seeking to avoid compelled disclosure of a confidential Whistleblower’s identity. In determining whether to refer a Whistleblower to the Signals Network for potential services, however, partner media organizations are responsible for considering how such disclosure might affect the ability to keep the Whistleblower’s identity confidential. The Signals Network will work closely with its media organization partners to provide a secure means for communicating a Whistleblower’s identity to it and, in appropriate circumstances, to provide services to a Whistleblower through a partner media organization without knowledge of the Whistleblower’s identity. The Signals Network is unable to provide support services to a Whistleblower whose name has not been made public except through a request made by a partner media organization following its publication of a report based, at least in part, on information provided by that Whistleblower.